Which leads us to our featured Store this week. 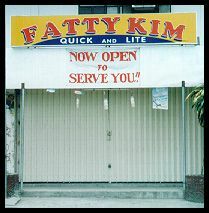 Now obviously, the owner of this store is named Kim. And he's probably fa...horizontally challenged. And how do we know this? Well, just look at the name! Not only is he fa...horizontally challenged, but he's proud of it! He's saying to the whole world, "I'm Kim and I'm fa...horizontally challenged, so come buy from my store!" What a statement folks, what a statement! I mean only a Filipino can have the gall, the courage and the guts to be proud of his fa...horizontally challengeability (Wha-at?). Hmmm...waittaminute. Maybe the name's supposed to stand for something else. I mean, it's a place that offers food, right? So if you put the two names together....Whoops! Ha ha! (Laughing at self) How silly of me! I didn't realize that the owner could have meant something else! Maybe he isn't fa...horizontally challenged! Maybe...maybe...oh heck, just check out the store yourself - and if you find out, tell me if this Kim guy is really fa...nevermind.